Just getting started, says Serena | Daily Express Online, Sabah, Malaysia. 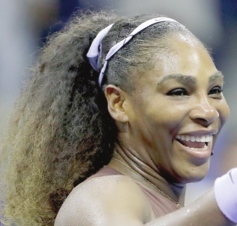 NEW YORK: Serena Williams once again targets a record 24th Grand Slam singles title at the US Open on Saturday.Win or lose, the US great says she's just getting started in the latest phase of her career. "I'm still on the way up," said the 36-year-old, who is playing her seventh tournament since the birth of daughter Olympia on September 1 2017. "There's still much more that I plan on doing." Williams came agonisingly close to matching Australian Margaret Court's all-time record of 24 major titles at Wimbledon, but fell to Angelique Kerber in the final. It was the high point of a return that began in March and has not surprisingly been, at times, erratic. But once again Williams has shown she can rise to the occasion on the game's biggest stages. Another US Open title — four years after her sixth — would be not a culmination but a springboard, she said. "I just feel like there's a lot of growth still to go in my game, that's actually the most exciting part," she said. "Even though I'm not a spring chicken, I still have a very, very bright future." Williams, who has spoken of the emotional roller-coaster of being a new parent, said adjusting to physical changes in the wake of motherhood has also been a challenge. Eighth-seeded Karolina Pliskova, who briefly rose to number one last year, fell to Williams in the quarter-finals, two years after shocking her in the semis.